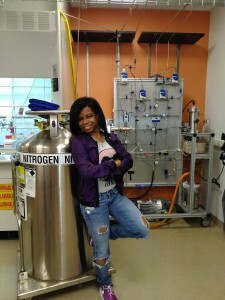 Real Scientists is in the US this week with Ashley Walker (@That_Astro_Chic), an undergraduate student and research assistant in astrochemistry at Chicago State University. Can you tell us about how you got into astrochemistry? I was interested in science as child but after graduating from high school, I wasn’t interested anymore (although biology was intriguing to me). I was into the arts, I wanted to become a choreographer, and was hoping to open my own dance studio one day. But then, l realized that the economy wasn’t great and I decided to look into some other career paths. One day, while watching the TV show “Criminal Minds”, I thought behavioral analysis and forensics was cool. So I decided to became a forensic toxicologist. I was still in junior college and I switched my major from business to chemistry. I was encouraged by the director of the Sci Chi scholarship program (which I am a recipient of) and my former research advisor at my current institution, Chicago State University, to pursue astronomy as a chemistry major. I began doing extragalactic astronomy research. I thought this was really cool [RS note: Yes. This is amazingly cool.]. I gravitated to the field, when I attended a workshop at the Green Bank Observatory during the summer of 2016 (UAT; Undergraduate ALFALFA Team). I met some really cool people. One of the speakers gave a talk about astrochemistry and I loved it. I knew then that I was staying in astronomy and never changing my career path again. How do you combine astronomy and chemistry in your work? I study the beginning stages of planet formation and planetary atmospheres from a chemistry point of view. Mainly understanding protoplanetary disks and the prebiotic chemistry of Titan. This summer, I had the amazing opportunity to be advised under Real Scientist alumna, Dr. Sarah Hörst and the fabulous Hörst lab. We recreate planetary atmospheres in our lab to get a better perspective of exoplanets, early Earth, and moons. People tend to be fascinated by astronomy especially planets. I want to educate the public on astrochemistry and planetary science. Titan is an awesome place to learn about. It’s the most intriguing moon in our solar system. We often learn something new every day about astronomy and it’s fascinating. I don’t see too many people that look like me in the field. I want more people of color to become involved in planetary astronomy. The goal is to have people from all walks of life to be excited about planets. Even if they’re not an expert. What kinds of things do you do when you’re not in the lab? I’ve been a part of the chemistry and physics clubs at CSU (Chicago State University), gave a talk at Adler planetarium, and mentoring other students about their career paths, life, and classwork. I roller skate, draw, play flag football, and different types of dances. My ideal day would be having my friends and family over my house and singing some karaoke while my cats are enjoying the music (they’re family too). Ashley Walker, welcome to Real Scientists!